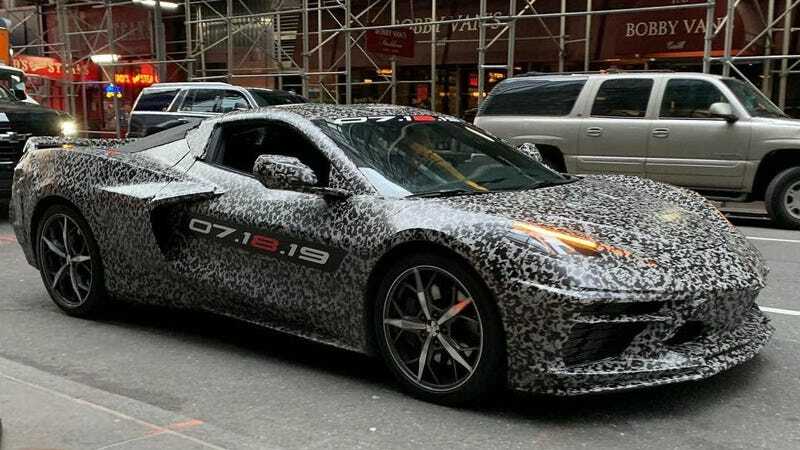 After years of teasing us with little trickles of news and public spottings in camo, the 2020 Chevrolet Corvette has finally officially been acknowledged as happening by General Motors. The car will be making its first public appearance in production trim on July, 18th. The car will be available for sale later this year. A new minisite has been made public on Chevrolet.com making the announcement official. The date has been stylized with the “8” in red, signifying that it’s the 8th generation of Corvette. I’ve heard my entire life that a mid-engine Corvette was coming right around the corner, but I never actually thought I’d live to see the day. The C8 Corvette will launch in base Stingray trim, according to Car & Driver, using an updated version of the current car’s 6.2-liter V8 with around 500 horsepower. We expect many high performance options to follow, but what we don’t expect is a manual transmission, sadly. The C7 Stingray starts at $56,995, and it wouldn’t make sense for Chevrolet to see a huge jump over that price for the original Red Blooded American Sports Car, but Car & Driver’s prediction of a $5,000 increase to around $62,000 seems reasonable for the increase in performance that this car is sure to provide.